children from 4 up to 8 years old. 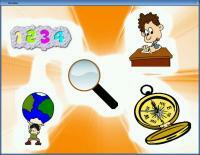 The game consists of three levels and it's map is bounded only to the Europe. countries on the right side. minute hand with mouse while pushing right mouse button (RMB). Mathematical operation +, -, x on 1- 20. - Compiling the Hollywood 4 (transparency RGB looks good on the AmigaOS 4.1). -  Added new level - mathematical operation (1 - 20). - Added always possible return to menu. - Added music level - guitar (hard level not available). - Added quit game button in menu. - Some bugfixes. First public version. Special thanks for Szymon Tomzik, Piotr Zadora and Lazar Zoltan.